The current, and several previous Mayors of Tampa, attended the grand opening of the Kennedy Boulevard Plaza segment of the Tampa Riverwalk on March 27 at Curtis Hixon Waterfront Park. “The Riverwalk has been in the making for 40 years, and it has taken the efforts of six mayors to be completed. Its construction represents the importance of the Hillsborough River as our best natural asset,” said Mayor Bob Buckhorn.” Spanning 1460 feet of water on the eastern side of the Hillsborough River, running underneath the Kennedy Boulevard Bridge, the segment links MacDill Park to Curtis Hixon Waterfront Park, and provides pedestrians and cyclists 1.8 miles of continuous, completed Riverwalk. The total project cost for the Kennedy segment is $9.2 million, which was partially paid for by a Transportation Investment Generating Economic Recovery (TIGER) IV grant awarded to the City of Tampa in June 2012 by the U.S. Department of Transportation. The TIGER grant will also go toward constructing the Doyle Carlton Segment of the Tampa Riverwalk as well as the Tampa Hillsborough Expressway Authority Selmon Greenway. 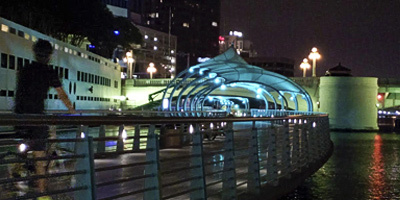 The City of Tampa recently received the permit by the U.S. Army Corps of Engineers allowing construction to begin on the Doyle Carlton Segment of the Tampa Riverwalk in Summer 2015 with completion in Summer 2016.